Are Your Emails Getting Opened? 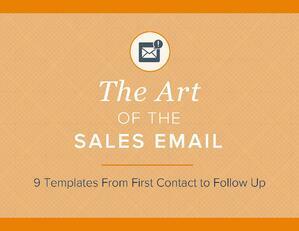 Your sales emails should be grabbing attention! We have the secrets to ensure your emails will get read despite the amount of messages business leaders receive on a day-to-day basis. Templates for cold outreach emails, follow up emails, asking for a referral, and other sales circumstances. Tips on how to customize and personalize sales emails. Expert opinions about why some email templates work better than others. Use the form to access these templates!